Embracing Wisdom proposes a theological interpretation of the Summa theologiae as a spiritual pedagogy ordered to the growth in wisdom, and thus in holiness, of preachers and confessors in the late thirteenth century. It proceeds along two unequal trajectories. The first proceeds by examining the social and cultural transformations of the late twelfth and early thirteenth centuries, and the spiritual crisis they occasioned for the Church, a crisis which called for the creation of a new kind of pastoral agent to take responsibility for the preaching of the Gospel. The analysis that follows develops a picture of the socio-cultural role of the theologian and preacher and brings to light the rhetorical means Aquinas deploys to promote the formation of wise preachers who can mediate the Gospel by means of new cultural forms. Successive chapters then present the pedagogical structure and spiritual dynamic of the Summa theologiae in light of these rhetorical principles, showing how it climaxes in the Christology of the tertia pars. This Christology is shown to promote communion with and conforming of the whole person to Wisdom Incarnate, transforming the student into an agent of Divine Wisdom in the world. 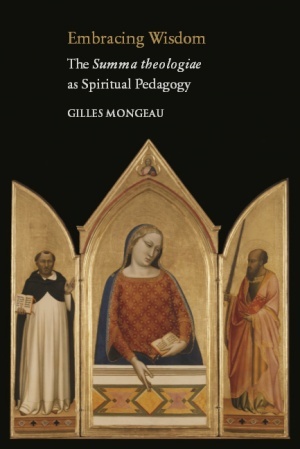 Gilles Mongeau is a member of the Society of Jesus and an associate professor of systematic theology at Regis College, the school of theology of the Jesuits in English Canada affiliated with the University of Toronto. He is also a visiting professor at Centre Sèvres, the Jesuit Faculty of Philosophy and Theology in Paris. He received his doctorate in theology from Regis College and the University of Toronto in 2003, following periods of research and study in Boston and Fribourg, Switzerland. He has served as director of the Master of Divinity formation program at Regis College, and is currently superior of the house of first studies (humanities and philosophy) of the English Canadian Jesuits in Toronto, Canada. In addition to his interests in the thought of Aquinas and in the role of the trivium in pre-modern theological method, he teaches and writes on the founding documents of the Society of Jesus.